If you read this blog on a regular basis then you know by the now that there are some twists I just can't resist adding to desserts. For example, if it tastes good on its own then it's bound to be better with a crumb topping. And, if there's a way to get a layer of cheesecake swirl into it, I will do so. But considering all that, I just don't understand why I needed someone else to show me that adding a cream cheese layer to my beloved crumb cake would be a good idea. I'm going to have to go see a doctor or something. Anyway, now that my eyes have been opened and I've seen the light, let's pause for a moment to give credit to the James and Everett blog for this inspiration. I didn't use their exact recipe because I have my own beloved crumb cake recipe and I've added enough streusel and cream cheese to things by now to know how to do it. So, should you do it, too? Oh, heavens yes! 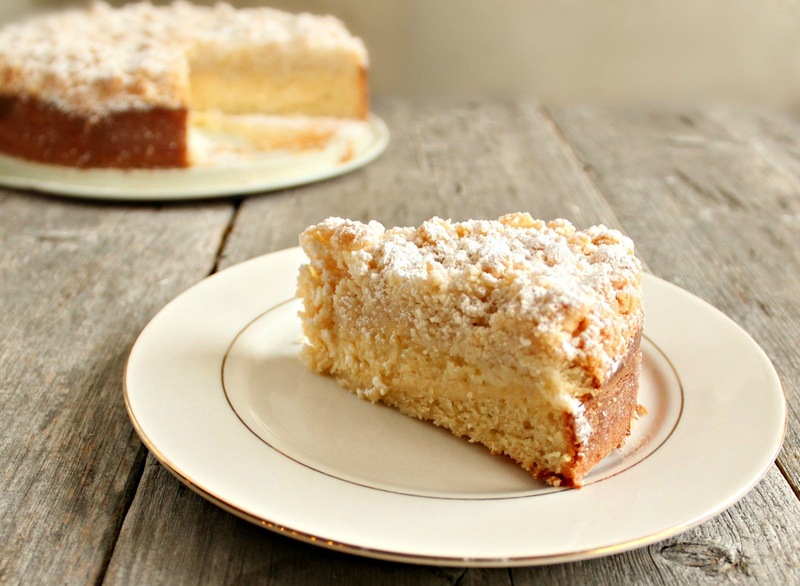 Lovely moist crumb cake made even more luscious with the sweetened cream cheese running through it. Thick, crumbly crumb topping that everyone knows is the best part. You need this cake. Actually...now that I think about it, you don't. Because if you don't want it there will be more for me. Just forget I said anything at all. What cake? Oh, all right, I'll share. As amazingly good as this cake was, I left it rather plain. A dash of cinnamon or touch of lemon next time would probably be worth trying. See, I knew there was a reason why I had to make it again. Enjoy! Make the crumb topping by mixing together the flour, sugar and salt. Cut in the butter with a pastry cutter or fork until the mixture resembles course crumbs. Cover and refrigerate while you prepare the batter. To make the cake, cream the butter and sugar together using either a stand mixer or a hand mixer. Add the eggs, vanilla, lemon zest and sour cream and continue mixing until combined. In a separate bowl, combine the flour, baking powder, baking soda and salt. Slowly mix into to the batter just until combined. To make the cheesecake layer, blend the ingredients with a hand mixer, stand mixer or food processor until thoroughly combined and free of lumps. To assemble the cake, pour half the cake layer batter into a buttered and floured 9" round spring-form pan (you can also bake this in a 9" square baking dish). Pour the cheesecake batter over the cake batter and gently spread out. Top with the remaining cake batter. Crumble the crumb topping evenly over the batter and bake in a pre-heated 350 degree oven for approximately 50 minutes or until a cake tester comes out clean. Allow to cool completely before removing from the spring-form pan. Dust the top with confectioner's sugar before serving. Makes approximately 10 servings. Woo-hoo more crumb cake! I think you make the best crumb topping in all the land. Oh my! My mouth is a gaping hole of awe as I look at this decadent crumb cake. I want it in my mouth! What a great addition :) Looks beautiful and so very tasty.. I'll be checking the mail for my portion! This looks and sounds so yummy, can't wait to do it myself when I have more people to help me eat it. Glad you are sharing this yummy recipe. Thank you! Um I think I just gained 3 pounds just reading this! Yum! yes please! This looks so soft and delicate! This cake has got it going on! Love the different layers of flavor and texture here! This looks heavenly. I think I'm going to make it for my baby shower. Maybe add some poppy seeds? It just looks too good! Thank you for sharing. As always, a bright and delicious spot in my day. I hope you have a wonderful and warm Spring week! ooooo wow crumb topping and cream cheese! YUM! I need to stop looking at pics of ur crumb cakes because all I am craving now is dessert! And its 9 am. Now THIS is my kind of dessert. Well done, Anita! I made this cake and I am very sad to say, it was not too tasty. :( I bake all of the time, but I don't know what went wrong here. It took much longer than 50 minutes to bake! And way too much flour in the crumb topping, didn't realy "crumb" up. Hi Sandra - I'm very sorry to hear that you didn't have success with this recipe. I've made it several times with good results so I'd like to try to help figure out what went wrong, if I can. When I make my crumb toppings I usually clump pieces together in my hands before sprinkling on top of the batter so perhaps that's why it didn't "crumb" up? As for the bake time, what was the consistency at 50 minutes and how long did your cake actually take to bake? Also, how long had the oven pre-heated before you put the cake in? Yes please! I'll take seconds on anything! with cream cheese too. Looks fabulous. Thanks so much for linking up this fantastic recipe at Weekend Potluck. Look forward to you coming back again soon. Anita, you are killing me!Since you and Brian had the first 2 slices, I'll just take the rest of this cake off your hands. Featuring this at Thursday's Treasures, can't wait to see what you share next! I have this in the oven as we speak...... CANNOT WAIT 50 minutes! !